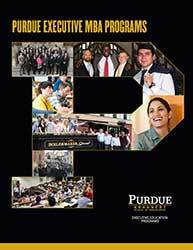 Purdue's two Executive MBA programs have many similarities, but they also have their own unique benefits. Please see this sample program comparison for a side-by-side look at the Purdue IMM Global Executive MBA and the Purdue Executive MBA. Let us know up to three other EMBA programs you are considering, and we will create a program comparison for you, stacking Purdue's two programs against your choices. Our program comparison offering is part of our Personalized Engagement Package, or PEP. Submit your PEP today!